We’re three-quarters of the way done with the Rosewater Conference, after some thundering matches this past weekend. In a stunning display of dominance, all four winning teams didn’t let their opponents surface for air once they had them under the boot. Each game was a two-game sweep in this best-of-three series, and their shattered opponents were carried out on stretchers. We also had a lot of activity in the Prediction League. In previous weeks, we’d seen some perfect predictions. Jay Chong claimed four points in week one, while Diannea, tenthtechpriest, scorium, signofzeta, and Brad all had perfect records in the second week of predictions. This time, however, everyone dropped at least one point on the day. Of course, none of the dropped points came from the first match, as Graveborn had 100% backing of the predictors and it did not disappoint. Said outhouseinferno, “there are decks in the Championship that can punish Graveborn if it misses a step. Bound by Strength is not one of those.” Hirshey lauded the deck’s synergy, and predicted victory for the reanimator. Only four others shared this opinion, proving that on any given day you never know who might turn in a real performance and punch above their weight. Most where right on the money, however, when it came to looking at Spectral Legions against the Commander deck Counterpunch. Noted Ezra the Strange of MMM, “Really close looking, but between the flying and removal its slightly better. And why not go with the deck that has team spirit (har har).” Thank you, thank you, he’ll be here all the week. Try the veal. As a result, some of those who were trailing just behind pole position in the past couple weeks were able to catch up, and we now have a real race on our hands! Here’s what the table looks like with this week’s points added. As always, mistakes can happen, and if you find any discrepancies simply alert us to them and we’ll be happy to revise. Finally, here’s the matches for this Saturday. Please make sure to leave a clear prediction for all three matches! The three-game weeks can be a real wildcard, since you have to pick the winner of the third match from your two choices in the lead-up matches. Here’s the bracket! Good luck to all our predictors. As always, we’ll accept predictions right up until the article goes live, at some point this coming Saturday. Good luck to all participants! It’ll be close, but I’d love to see Graveborn take it all. PDS ftw! Ok, who has the better chance of winning? Who do I want to win? C’mon intro packs. Show me that you don’t belong in a bush, ahem, farm league. Just to clarify, which ones are you choosing for the League? but it would be cool if intro packs could win at least half the matches against event decks. For next year, I would love to see an intro pack only precon tournament to turn up the unpredictability. So far, everybody is picking Graveborn and Deathfed to win because they know, that intro packs’s chances of beating an event deck or a $35 PDS precon is very slim. Alright, mate, let me go ahead and address this here, as it seems an insistent point. I’m a huge fan of Glasgow Celtic football. Huge. They’re the reigning champions of the Scottish Premier League, which is to say that with all love and respect they’re like an Intro Pack deck in the Champions League. No-one predicted we’d go far in the Champions League, and that comes with the territory. Two nights ago I sat huddled around the screen with my 2-year-old son and 11-year old stepson, watching our heroes take the field against one of the very best teams in the world, Barcelona- and in Barca’s home (Nou Camp) no less. Partway through the first half, Celtic scored, but Barcelona is Barcelona, and the 75/25 split of possession in their favour raised no eyebrows. They were relentless in the first half, and while we didn’t quite park the bus behind the ball, we hunkered down and tried to weather it out. Lamentably but inevitably, Barca leveled before the half, and we then watched with white-knuckle nerves as Celtic tried to hold on to the draw to walk away with a point. Walk away with a point… if they’d managed even that ‘humble’ task, they’d be only the third team this year to do that at Nou Camp- it so rarely happens. The dagger came with about 30 seconds to go, deep into the four minutes of injury time. Barca scored. Celtic lost. I felt like I’d been kicked in the solar plexus. But I’d never have missed it for the world. You might be wondering what the point of it is, but I might ask what’s the point of me watching? Why do ‘lesser’ teams have any fans at all (aka: from a historical sense, why aren’t we all Yankees fans?)? Maybe because we love our team, and we love the competition. You’re right, “intro packs never win except by flukes and upsets” is an accurate statement, because any time an Intro Pack wins against tougher competition it’s an “upset.” But it doesn’t invalidate the attempt, and every March Madness you see a different college claim the Cinderella Story crown…winning by flukes and upsets. I love that you have such a passion for the same thing I have a passion about, preconstructed decks. I think your ideas about all-Intro pack competitions are something I’d gladly watch. But there’s only so much time and “design space” on Ertai’s Lament to go around, and polling the readers has shown that twice a year is about right for these competitions, lest they become too commonplace and lose some of the magic they have. I like the “all-deck” format precisely because it produces those flukes and upsets, and going by past comments and enthusiasm after unexpected results it seems I’m far from alone. You’re full of fantastic ideas that you’ve shared both here and on MTGS, like the Intro-Pack face-off, and the Intro Pack league. I’d love to see you pull those off…have you considered setting up your own site? Preconstructed is quite the niche, so another site would be tremendously welcome! Our format here, though, is going to remain the same. Thanks for the comment! I’d rather see an intro pack exclusive championship. It give a lot of unpredictability, so far, it is a given that Graveborn, or Deathfed would win. I mean, they are built to be better than intro packs, and if an intro pack does win, it is called an upset. I agree. The event decks are just built for a completely different environment, an environment much more cutthroat. It’s like watching a professional football player punch a five year old in the face and calling it a fair match. What’s so fun about the CFL, compared to the NFL is that you can see a team with a 5 and 11 record and still win the grey cup. GO BOMBERS!!! But seeing an event deck face an intro pack is so lopsided it isn’t even funny. hey, at least make it like sports betting, where if you guess the one that is more likely to lose, you get more points. I mean, my cousin bet $5 on party poker that the Bombers would beat the Alouettes, and the odds are something like he gets 7x the bet if the Bombers win, while those who bet on the Alouettes gets x1 or something, if they win. To be fair, deathfed could beat Graveborn, as both are GY decks. One thing that makes Graveborn scary is it’s cheap GY tutoring. Should Graveborn get a hand with buried alive or a similar card, it won’t lose unless it lacks a way to resurect creatures. I havent commented for two weeks, so let’s GOOO!!!!!!!! the reason for Deathfed is simply the number of creatures it has to offer against Graveborn and the quality of Ramp. The acid slimes can potentially put a damper on manabase for Graveborn and Bonehoard is looking at both graveyards. As a result it comes down to if Graveborn can reanimate fast enough and I don’t think so, considering how much on curve Deathfed is. I believe you didn’t add the one point I got for last round. Spectral Legions… fortune favors the bold, and it’s all for fun anyway. Right you are, my apologies! I’ve corrected it on the chart, and it will be counted in next week’s leaderboard. Thanks!! Blood and Fire will cry if it sees Sphinx of the Steel Wind or Blazing Archon. Deathfed’s defense is mitigated by the fact that every single creature in Legions flies or makes flying tokens. If Deathfed wins, it’s because it cast Spider Spawning or because it cast all its big beaters and Legions didn’t draw removal. Legions’ piddly flyers can’t really stop giant fatties, and Deathfed’s ground defense can’t stop aerial fat. Both decks roll over to Inkwell Leviathan in particular. I can’t believe I’m up there! Ok, time to test my luck. 3) Blood and Fire. Bloodthirst is a very strong ability, I’ll think in my dream match without premium product this will prevail. Graveborn – In the end, I think Graveborn is just too strong for all of ’em. * – Please don’t take points away for that. I’m sorry! Game 19: Graveborn. Blazing Archon says O HAI THAR. Game 20: Spectral Legions. Mono-unblockable blanks Deathfed’s primary way of getting creatures off the board, ensuring Legions’ auras will stick, and most of Legions’ removal doesn’t even have the courtesy to put more creatures in the graveyard. Game 21: Graveborn. See Game 19. 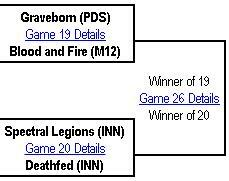 Game 19 will be swept by graveborn, it is quite fast and blood and fire just doesn’t have the tools and defense to stop it. It will try to chump-block but ultimately it will lead to graveborn winning. Game 20: Deathfed already proved to be solid by winning against the vampires. Spectral legions is a flier mid-game azorius deck. By the time spectral legions has its fliers out, deathfed will be attacking with huge creatures and have spider spawning ready for defense. Deathfed has a much higher probability of winning here. Game 26: the final for the bracket. It will be taken surely by graveborn, but I can see deathfed winning at least one game. If graveborn has problems pitching the right cards into the GY at the beggining, it could give deathfed enough time to deploy its army of spiders and huge beaters. But most of the time graveborn will be able to put out threats during the first 4 turns, and apply pressure from there. With eleven revival spells, it is almost guaranteed to revive something by turn 4. The hardest matchup for graveborn yet, but it will still prevail. Deathfed: it looks pretty close but I think that between ratchet bomb, spider spawning, gnaw to the bone, and spinterfright, this deck has what it takes to dispirit the spirits. Graveborn: I think this deck has a chance at being the champion. Let’s see what my fellow readers and competitors think about that!